Even with the pressure of one of their most important competitions of the season to prepare for, members of Jersey Surf found time out of a busy rehearsal schedule on Saturday to give back to the Allentown community. 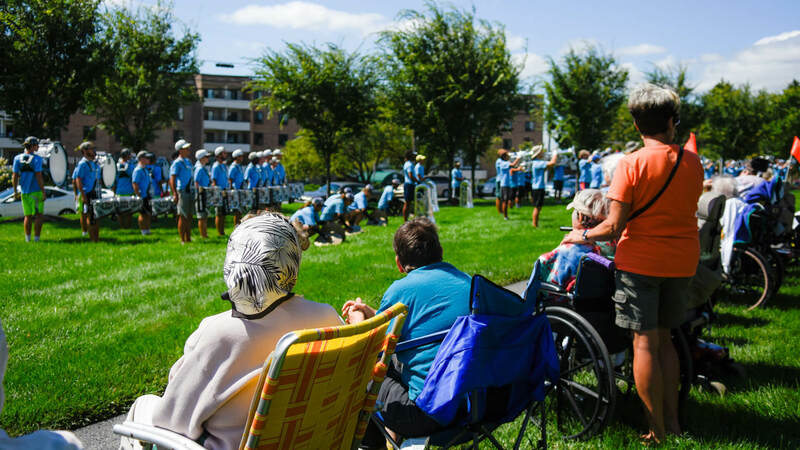 The morning of the second day of the DCI Eastern Classic, the corps from Camden County, New Jersey worked up a special performance for the elderly residents of the Phoebe Allentown Healthcare Center. The opportunity came together thanks to Mitch Huston, who in addition to working as a sales and marketing director for Phoebe Senior Living, also serves as the chair of the DCI East committee which has long helped Drum Corps International run the annual DCI Eastern Classic competition in Allentown. Jersey Surf members perform on the front lawn of Phoebe Allentown. 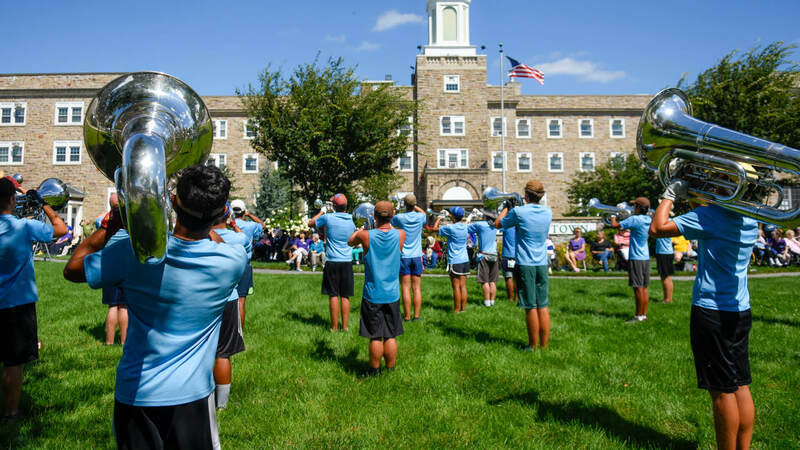 “Having known (Jersey Surf executive director) Bob Jacobs for 27 years, I called him and asked him since the corps was going to be utilizing J. Birney Crum Stadium for rehearsal all day what it would take to march the corps up the hill and have them perform for the residents,” Huston said. With the facility conveniently located across the street from the backside of the stadium, Huston says that Phoebe residents are well-versed in drum and bugle corps, as the sights and sounds of one of Drum Corps International's longest running annual events in August are a familiar occurrence. Saturday's special performance included a meet-and-greet with corps members. 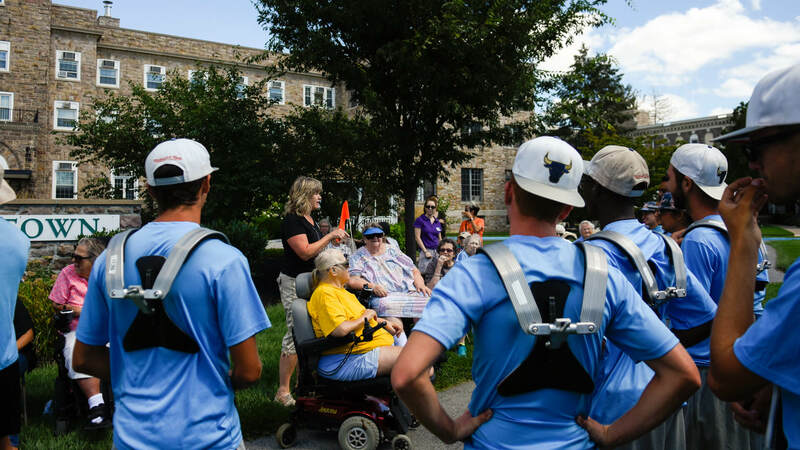 Breezy, partly cloudy weather set the stage for Jersey Surf's brass and drum line to entertain the residents who gathered on the front lawn of the sprawling facility. The performance was followed by a quick meet-and-greet between corps members and residents. Jersey Surf drum major Katie Liming said the entire event was a meaningful opportunity that fit right in with the corps' “Share the Love” philosophy. Drum major, Katie Liming, of Jersey Surf World Class Drum Corps talks about the unique opportunity the corps had this morning to perform for residents of a local nursing home in Allentown, PA.
Liming said the residents were both impressed and interested in how the performers tackle the season and how the drum corps activity has changed throughout the years. Bolich said she loves the idea of having more drum corps brought out to entertain and that it would be well-received by residents in the community — Most of them, anyway.